Few things stoke my coals more than a good civil management sim, SimCity, Prison Architect, and Banished have all sucked up my team recently but nothing’s scratched my municipal transport itch. That’s where TrainFever comes in. The game kicks off in the 1840s and runs up to the modern day, letting you build networks for horse drawn carriages, steam trains, and electric overhead rails of today. 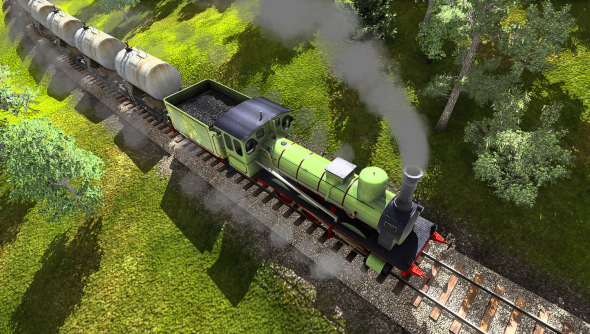 Swiss developer Urban Games are focussing their transport tycoon specifically on trains, placing you in the manager’s seat of a transport company. You’ll be in charge of freight haulage contracts and bringing money into your company so you can adopt new technologies as they develop. Cities, too, will grow through the years and you’ll be called upon to expand your network to suit. The video above shows off some of the tools that you’ll get your hands on. There’s no grid underlying the game so your tracks can be bent into any reasonable shape you need. “Each person is individually simulated,” write Urban Games. “[They’re] given a home address and a working place.” They then take the closest and cheapest option to travel. It’s on you to monopolise on that. The buildings are also generated. According to the developers, you won’t see the same building twice. You’ll see the building’s generate sensibly, too. High quality residential areas will be distant from industrial zones but the cheaper housing will be shrouded in pollution. Reading through Urban Games’ site has me keen to get into the manager’s seat.